So today is the big day. 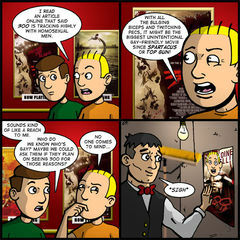 300 is in theaters and buzz seems to be at a fever pitch. I have to hand it to the marketing team that put 300 in the thoughts and hearts of the movie-going public. It seems like everyone I talk to is excited for this movie. They’re even excited about it where I work. 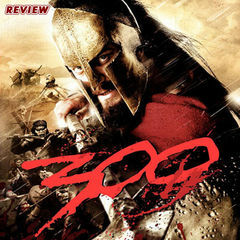 I don’t know if I have any particular insights about 300. Early reviews seem to be positive. Sadly, I don’t think I’ll be able to see it in theaters. We haven’t really left the house since Henry was born, you know. I don’t particularly mind. I’ve always been a homebody. Cami and I have our 7 year wedding anniversary on March 18. We might try to get out of the house then and have our parents watch Henry for a couple of hours. But if we end up seeing a movie, I doubt I can talk Cami into seeing 300. I guess I’ll be patient and wait for it on DVD. I hope you guys enjoyed today’s comic. It’s a simple joke, but I kept chuckling to myself when I came up with it. I find the further I go writing Tom as a character, the more I revel in his child-like denial. It makes me wish I could get away with it in real life and still be endearing. That’s really all I have for you with this post. I don’t even have much to schill! I expect the Junkie shirts will be back from the printer early next week, so I hope to have those shipped out soon. I’m also starting to run low on copies of Theater Hopper: Year One. The bundles have proven successful in that regard. So if you’ve been dragging your feet on either of the books, now is the time to order them. Okay, maybe a little schilling. That’s all for now. Thanks to everyone who welcomed me back to my first full-week on the comic since the February hiatus. I’m still managing to work ahead and I think I’m adapting well. So far so good! Let’s keep our fingers crossed, huh?